So I was like “hmm…I think I saw some paleo postings about these. I have open coconut milk, and some thawed chopped spinach, this here sauce and oh yea, prosciutto” and that is how I made these. Party people, these are tasty. And the coconut milk and tomato sauce actually creates a really amazing creamy non-coconut tasting sauce. If you’re feeling generous, as I always am with myself, some extra lovely cured meats on the side because why not?As you will see, the recipe for this is VERY precise. This is easily scaled to feed an army, but the recipe below is for one persona. 4. Remove ramekin from oven and add egg. Bake for another 12-15 minutes. But be careful to keep an eye on things! Eggs will be done when whites are mostly set. Remember, they’ll still cook once you remove them from the oven. 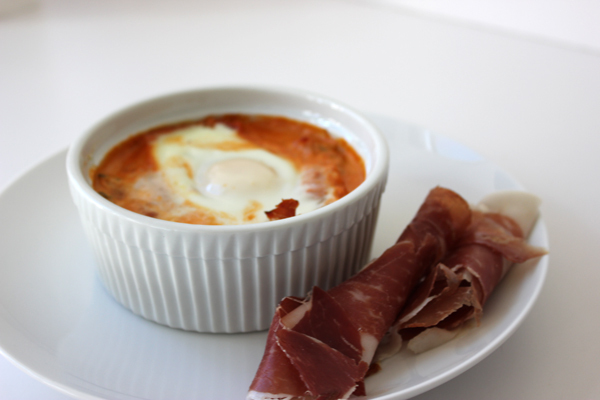 Um, holy yum–I made eggs in ramekins recently, but I didn’t add tomato sauce AND NOW I NEED TO YUM! Holy mother of… I need to eat this ASAP.